Richard Sebring is Associate Principal Horn of the Boston Symphony Orchestra and Principal Horn of the Boston Pops Orchestra. Previously Principal Horn of the Rochester Philharmonic, he joined the Boston Symphony in 1981. Mr. Sebring has been a soloist with the BSO and the Pops in Symphony Hall, at the Tanglewood Music Festival, and on numerous world concert tours. As a studio musician, he is heard regularly in popular music, on PBS, and in motion picture films. He is an accomplished composer and arranger for art and commercial films, and his arrangements of holiday and ceremonial music have been played by the Boston Pops at Symphony Hall and at Fenway Park. Mr. Sebring is on the faculty at the New England Conservatory of Music and the Tanglewood Music Center. Kai-Yun Lu was already well known in Taiwan as a soloist and winner of several competitions, both as a pianist and clarinetist, when she came to the United States to study at the New England Conservatory of Music and pursue a career as a clarinetist. In her sophomore year at NEC she won the school’s annual Concerto Competition, becoming one of the youngest winners in its history. She has subsequently performed concertos with the Cambridge Symphony Orchestra and the Taipei Symphony Orchestra. Ms. Lu is currently Principal Clarinet of the Atlantic Symphony Orchestra. She also performs regularly with the Pro Arte Chamber Orchestra, the Boston Symphony Orchestra, and the Boston Pops. Pianist Vytas J. Baksys is an active freelance collaborator performing recital, chamber, orchestral, and other concerts of various styles and genres throughout North America, Europe, and Asia. Since 1989 he has been the faculty pianist with the Fellowship Conducting Program at Tanglewood, and he is a frequent keyboardist with the Boston Symphony and Boston Pops orchestras. 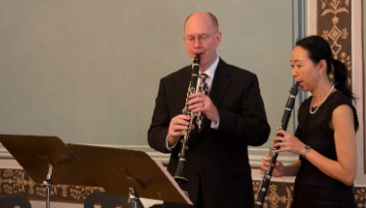 He also works with Boston Musica Viva and the Boston Symphony Chamber Players. He has participated in recordings for RCA, Sony Classical, Deutsche Grammophon, Nonesuch, and BSO Classics. Digital downloads at iTunes and CD Baby, also coming soon to Amazon. Hardcopy CD available from TMF. ﻿﻿﻿﻿Thomas Martin is Associate Principal Clarinet of the Boston Symphony Orchestra and Principal Clarinet of the Boston Pops Orchestra. Mr. Martin has worked with most of the world’s leading conductors, soloists, and entertainers and maintains an active schedule as a soloist, chamber musician, and teacher. In 1998 he gave the U.S. East Coast premiere of Elliott Carter’s Clarinet Concerto at the Tanglewood Music Festival, and performed it once again in 2008 as part of Tanglewood’s Carter Centenary Celebration. Mr. Martin gave the world premiere complete performance of Carter’s Poems of Louis Zukofsky with soprano Lucy Shelton during the 2009 Tanglewood season. Unusually adept at straddling worlds of classical and jazz, his numerous and highly acclaimed solo performances with the Boston Pops include a 1997 Evening at Pops nationally televised performance of the Artie Shaw Clarinet Concerto and a 100th-anniversary tribute to Benny Goodman in June and August of 2009. Mr. Martin and the Boston Pops repeated this tribute in Carnegie Hall in 2012. In May of 2010, Mr. Martin performed with the Hawthorne String Quartet at the Prague Spring Music Festival, where he premiered a clarinet sonata composed for him by André Previn, with the composer at the piano. In 2011 Mr. Previn composed a clarinet quintet, commissioned by the Terezín Music Foundation, for Mr. Martin and the Hawthorne String Quartet, who gave the world premiere in Boston’s Symphony Hall in November 2011.